Qbox reads input from standard input and writes output to standard output. It can be used either interactively or in batch mode. Qbox then expects the user to type a command. Each command is processed sequentially and output is printed to standard output (i.e the screen), until the quit command is entered. sets the variable ecut to the value 24. This causes the plane wave basis set to be resized to include all plane waves with a kinetic energy not exceeding 24 Rydberg. Other Qbox variables can be set similarly. Qbox variables have a default value. Some variables take multiple values (e.g. cell). A complete list of Qbox variables is given in the Qbox variables Section. As a simple example illustrating the structure of a Qbox input script, we consider the calculation of the energy of a methane molecule (CH4). followed by a geometry optimization and a molecular dynamics run. In lines 2 and 3, the species command is used to define two new species (carbon and hydrogen) in the simulation. This assumes that the files C_HSCV_PBE-1.0.xml and H_HSCV_PBE-1.0.xml are present in the current working directory. These files contain the definition of pseudopotentials that describe the electron-ion interaction for carbon and hydrogen respectively. Lines 4-8 use the atom command to define new atoms at their respective positions (bohr) and give them appropriate names. Line 9 defines the dimensions of the unit cell by setting the value of the cell variable (bohr). The unit cell is a cube of side 15 (bohr). Line 10 sets the value of the plane wave energy cutoff (variable ecut) to 35 Ry, which resizes the plane wave basis accordingly. Line 11 defines the algorithm used to update wave functions by setting the variable wf_dyn to PSDA (Preconditioned Steepest Descent with Anderson acceleration). Line 12 sets the xc variable to PBE to select the PBE exchange-correlation functional. Line 13 defines the tolerance used to determine convergence in self-consistent iterations (variable scf_tol). Iterations are considered converged when the energy changes by less than 10-8 (hartree). Line 14 uses the randomize_wf command to add random numbers to the electronic wave function coefficients before starting the calculation. This is necessary to avoid spurious stationary points in the optimization for systems of high symmetry (such as CH4). Line 15 invokes the run command to perform the calculation. The first argument (0) refers to the number of ionic steps (during which the atoms are moved). This is zero for the present calculation since we are only computing the electronic wave functions with fixed atoms. The second argument (200) is the maximum number of self-consistent iterations performed. The actual number of iterations may be smaller if the convergence criterion scf_tol is reached before 200 iterations. Line 16 uses the save command to save the description of the current system (atomic species, atomic positions and wave functions) on file gs.xml for later use in other calculations. Using grep retrieves the lines containing the '<etotal>' string. This will include the value of <etotal> in this case, but does not work for elements that span multiple lines. Fig. 1 Intermediate energy <etotal_int> during self-consistent iterations. This allows for a quick inspection of the convergence of the calculation. 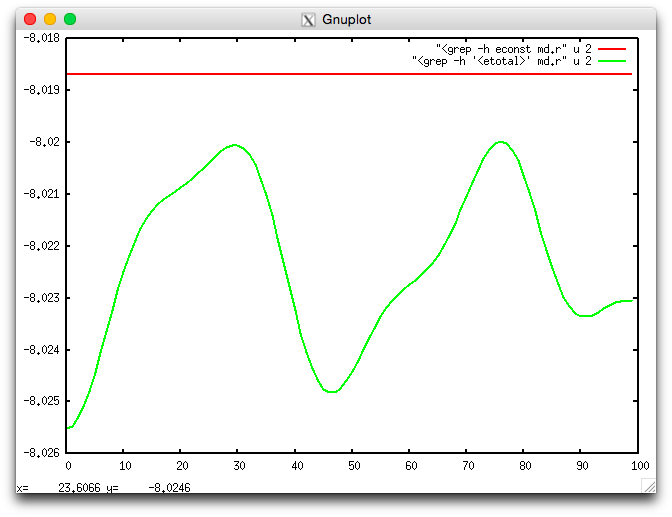 The gnuplot program is not provided with Qbox and must be installed separately. The above calculation of the electronic ground state used approximate atomic coordinates based on a reasonable guess of the structure of the CH4 molecule. A natural next step is to optimize the molecule geometry to find its minimum energy structure. In line 2, the load command reads the description of the sample previously saved in the file gs.xml at the end of the ground state calculation. Lines 3-5 set the wf_dyn, xc, and scf_tol variables as in the ground state calculation. Line 6 selects the algorithm used to move atoms as CG for “conjugate gradient). Line 7 invokes the run command to perform the calculation, with 10 ionic steps (where atoms are moved) and 10 self-consistent iterations before each move of the atoms. Line 8 uses the save command to write the description of the sample to the file cg.xml for later use in another calculation. Fig. 2 Energy <etotal> during the geometry optimization. 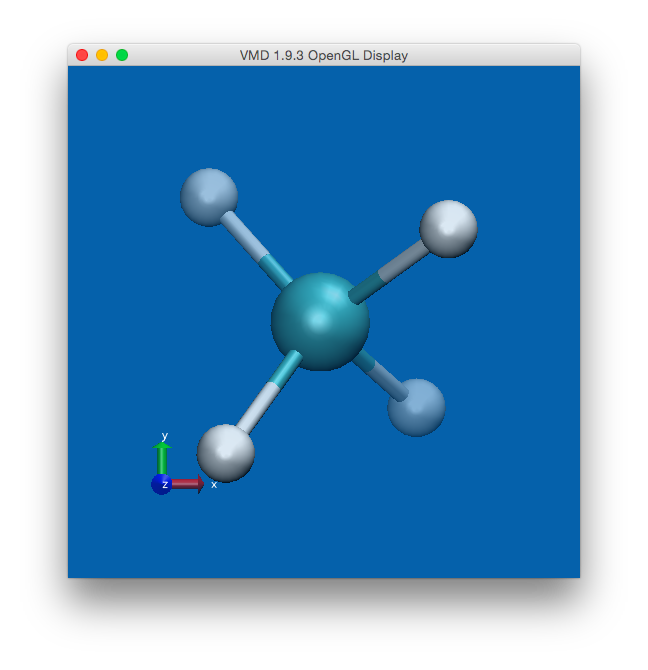 We now demonstrate the use of Qbox in a short Born-Oppenheimer molecular dynamics simulation. The simulation consists of 100 MD steps, with a time step of 10 (a.u.). Atomic velocities are initialized with random values from a Maxwell-Boltzmann distribution at a temperature of 400 K.
In line 2, the load command reads the description of the sample previously saved in the file cg.xml at the end of the geometry optimization. Lines 3-5 set the wf_dyn, xc, and scf_tol variables as in the ground state and geometry optimization calculations. Line 6 sets the variable dt (time step) to 10 (a.u.). 1 (a.u.) = 0.02418885 fs. Line 7 selects the algorithm used to move atoms as MD (molecular dynamics). Line 8 uses the randomize_v command to initialize atomic velocities with random numbers drawn from a Maxwell-Boltzmann distribution at T=400 K.
Line 9 invokes the run command to perform the calculation. The simulation consists of 100 ionic steps, with 10 self-consistent iterations before each step. Line 10 uses the save command to write the description of the sample to the file md.xml for later use in another calculation. Fig. 3 Energy <etotal> during the molecular dynamics simulation. Fig. 4 Energy <etotal> and constant of the motion <econst> during the MD simulation. 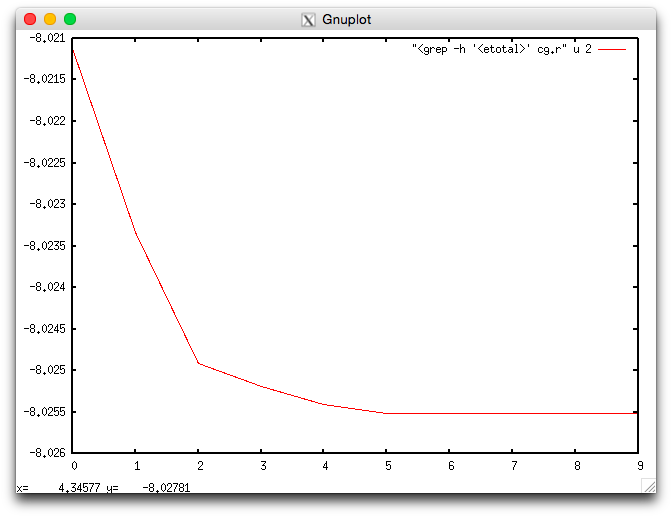 The quantity <econst> shows no appreciable variation on the scale of the variation of <etotal>, confirming the validity of the approximations used in the simulation. Inaccurate calculations of the electronic ground state between MD steps (due e.g. to an insufficient number of self-consistent iterations) typically lead to a sizeable drift in the value of <econst>. 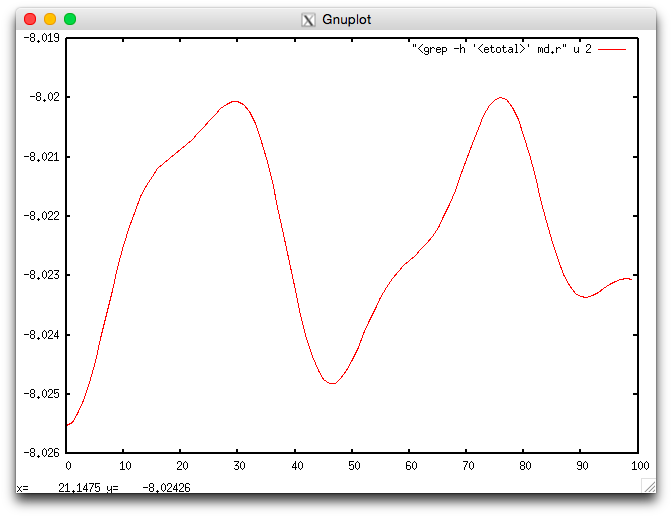 Similarly, oscillations in <econst> may be observed if the value of the time step dt is too large. Fig. 5 Visualization of the CH4 molecule using the VMD program.